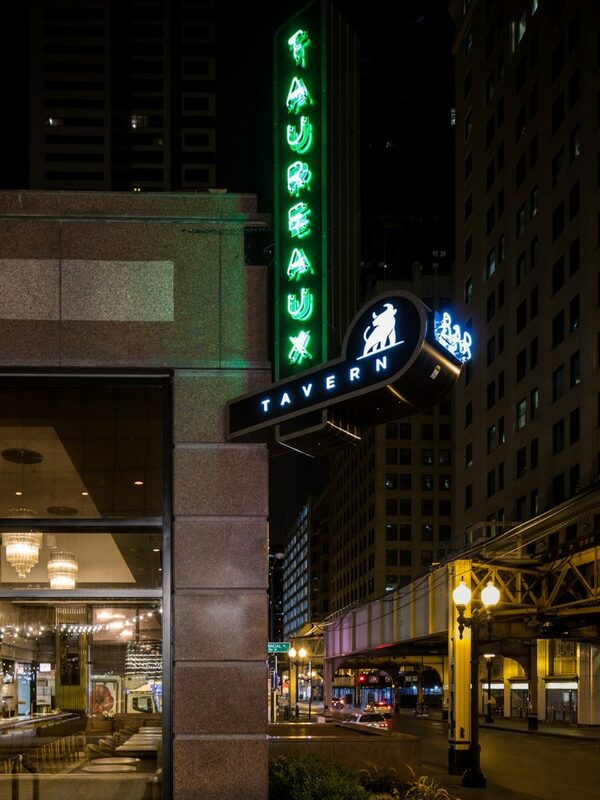 The owners of Cochon Volant Brasserie called upon 555 International to design and build their fifth restaurant, Taureaux Tavern, in Chicago’s Downtown Financial District. 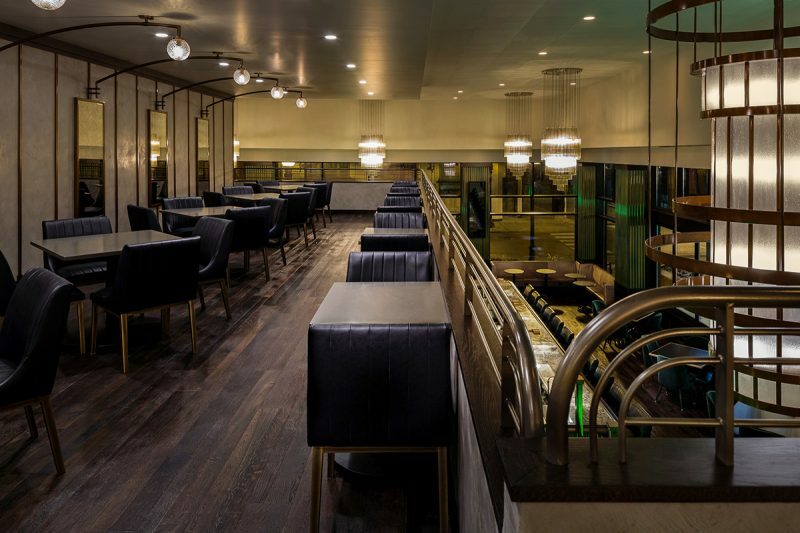 Located next to The Chicago Board of Trade, Taureaux introduces a breath of fresh air to the neighborhood’s limited restaurant scene, targeting daytime trader clientele seeking to entertain clients in an elevated environment. French restaurants are common in Chicago, so to shake things up, 555 International’s design team pulled inspiration from our surroundings and the history of the neighborhood to enliven the storytelling layered in the interior design. Established in 1848, The Chicago Board of Trade is one of the world’s oldest futures and options exchanges. 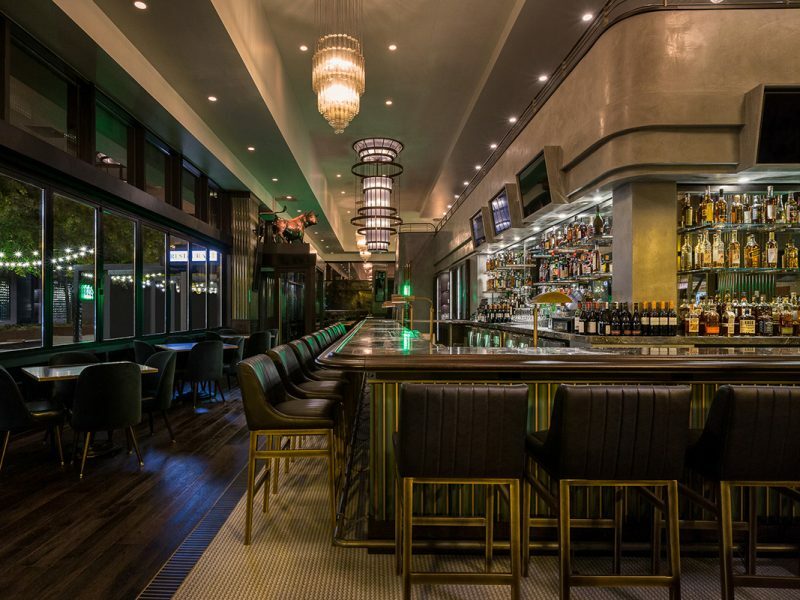 Pulling cues from this historic landmark, Chicago’s architectural history, and old-world banks, the interior design of the restaurant oozes traditional opulence in way that feels unpretentious and approachable. To create a grand entrance, 555 designed and built a custom 10ft high tiered chandelier made out of copper and decorative glass. Suspended from the ceiling, the shape of the chandelier mimics the Art Deco architectural curves in the soffit and railings. 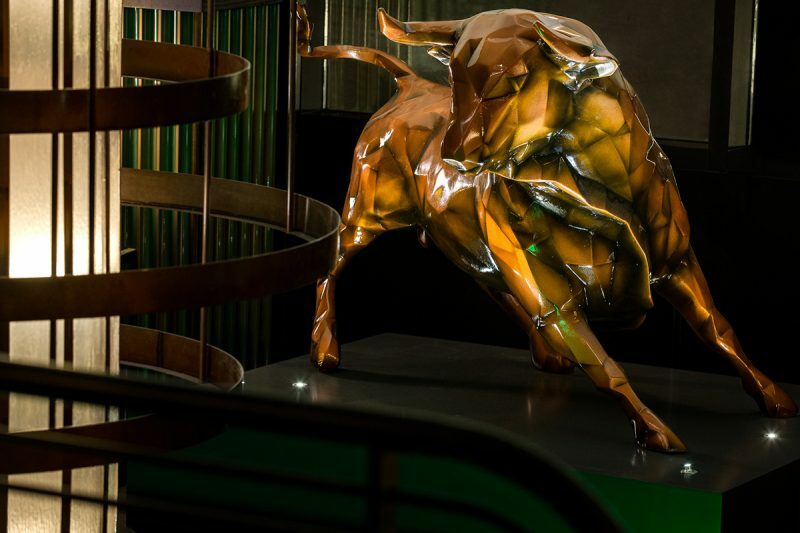 Over the doorway a copper coated faceted bull sculpture marks the entrance, paying homage to the restaurant’s name, which is French for “bull”. Antique lighting fixtures and plaster finishes create the illusion that the restaurant has been there for years. Art hanging on the walls features authentic photos from the Chicago Board of Trade from the 1940s and 50s. 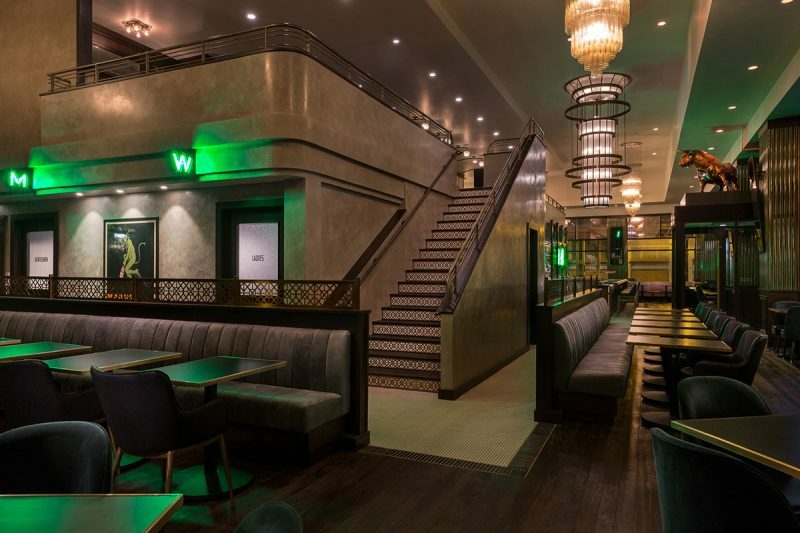 Custom tile flooring and metal patterned screens on the banquets and stair risers add to the decorative nature of the space. Corner signage wrapping the building draws guests in from the street, while custom neon signage and hand painted details on bathroom doors and back bar add visual texture.